Mary Jane Eisenhauer's love of teaching young children, exploring ways to help them learn and mentoring new teachers made her the perfect person to help start Purdue North Central's four-year early child education program. 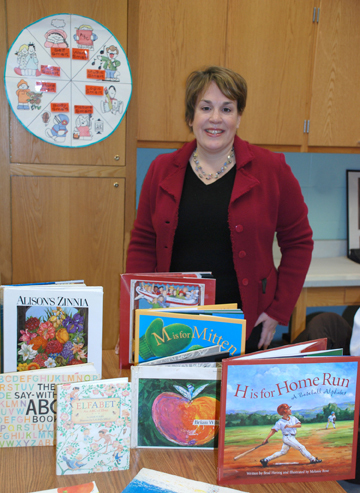 Eisenhauer, assistant professor of early childhood education, started the program along with her colleagues in the campus' Education Department in fall 2008. In May 2012, the program graduated four students. Eighty-seven students are enrolled in the program now. What was the idea behind starting this program? In 2006, it came to the campus' attention that there was a real need for this program in the community. There were a lot of folks who were teaching at various schools and facilities who wanted a degree, and there were a lot of schools and facilities that wanted to hire folks with degrees, so our faculty members decided to create this program. Also, in 2007, the federal government passed a mandate that half of teachers in the Head Start preschool program must have bachelor's degrees, so that intensified the need for our program. Also, in general, there's a level of professionalism and expertise that's in demand when it comes to early childhood educators. Our program provides both. How did you go about creating a new academic program? It's an incredibly involved process -- as an educator, I really feel like I've given birth. There was a period of time where every class I taught was brand-new. Luckily, my colleague and program co-founder Deb Pratt is very knowledgeable, so we worked to develop syllabi and propose courses through our Faculty Senate. Along with that, other ongoing tasks include supervising our students' field experiences. I also advise an early childhood education club here on campus. It's called Purdue Learning About Young Children in Education, or PLAYCE, and its members are very enthusiastic and dedicated to the field. What do students learn in the program? Right now, the program is a combination of general education courses and early childhood education courses, which are divided along four themes. In the program's first year, students learn what it means and what it requires to be an early childhood education professional. For example, we expose them to a variety of career options, including family education, advocacy work, and others in addition to teaching children ages birth through grade three. In the second year, the coursework revolves around understanding child development, including exceptionalities in development. In the third year, we get into the teaching and learning processes early childhood educators use, including developing curricula and using appropriate practices. In the fourth year, we revisit the first year's theme, but with an emphasis on experience -- our students are in the field during this year. They complete a practicum in which they work intensively with children who are 3 or 4, and they complete a 16-week student-teaching experience with kindergartners, or with students in grades one, two or three. Is there anything you'd like to add to the program in the future? I'd like to create more opportunities for our students to grow through experiences elsewhere, whether it's elsewhere in the state or abroad. We are a regional campus and I want our graduates to focus on investigating our needs in Northwest Indiana, but I also think our students should learn about what's happening in the field in other parts of the U.S. and in other countries. They'll be able to draw upon what they learn elsewhere once they return here, and that's good for their overall education. How has the community reacted to Purdue North Central's early childhood education program? The time was really right to start this program, so we've gotten an incredibly positive response from the community. For example, from the beginning we've had agencies, schools and child care centers calling to ask when they can host our student teachers. There's been a lot of excitement, encouragement and support so far. One fact that really speaks to our success is the fact that all four of our initial graduates found employment in the field immediately. They're in diverse fields, illustrating the versatility of this degree -- one is working for the state on the Healthy Families initiative, another is working for the state as a developmental therapist, the third is working in a public school in a special-needs classroom for 3- and 4-year-olds, and the fourth is teaching second grade. There is a wide array of factors combining to make the environment great for our program. We have a real need for it in our community, opportunities for graduates are plentiful, and we have great students -- some of whom are already in the field, adding to the opportunities for less experienced students. We just couldn't ask for better circumstances going forward.